Tulsi is the Sanskrit word for holy basil. This medicinal herb has a long history as part of the Ayervedic tradition, according to Drugs.com, a drug information site that provides peer-reviewed information to consumers. The herb grows wild in tropical and sub-tropical regions, according to MedicinalHerbInfo.org. It’s also widely cultivated for its reputed spiritual and medicinal properties. Before using tulsi, or any other medicinal herb, consult your health care provider. Tulsi has many traditional health uses, including treatment of eczema, psoriasis and aging effects. It is also used as an antibiotic, an immune system booster, an anti-inflammatory and a stress reducer. In its native India, tulsi is considered a sacred plant and no household would dare be without the plant, according to an article at Acadamia.edu. The use of tulsi while pregnant or breast-feeding could potentially be harmful to your unborn child. 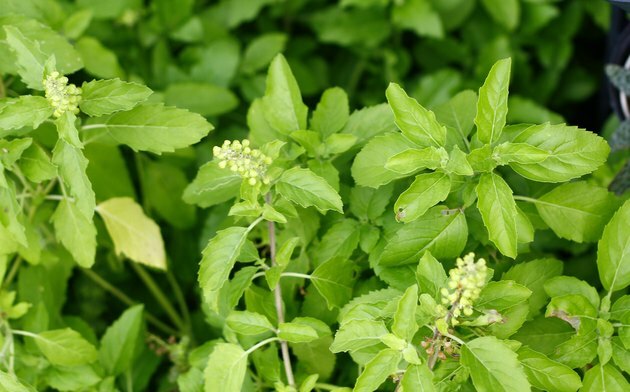 Use of tulsi is discouraged while pregnant or nursing, and tulsi has also been reported to cause lack of fertility in animal studies, according to The Chopra Center. Avoid tulsi when even considering getting pregnant. Men and women trying to procreate are also warned to avoid tulsi because of possible problems with fertility. According to Drugs.com, using tulsi while also using acetaminophen can cause harmful interactions. The site also cautions against using tulsi while also taking barbiturates or other sedatives. If you have questions about whether taking tulsi will interact negatively with other herbs or medications you are taking, talk with your pharmacist or health care provider. According to an article in "Natural Product Radiance," the tulsi herb is available fresh, in capsules, tea and in a tincture. The best way to get fresh tulsi leaves whenever needed is to keep a pot of the herb growing in a kitchen window or on a sunny porch. It is possible to experience an allergic reaction to tulsi, according to Drugs.com. Taking any medicinal herb can cause an allergic reaction, even if it’s been taken before with no reaction. Be aware of rashes, hives and signs of swelling of the tongue, lips, face or throat from taking tulsi and if these occur, stop using it and contact your health care provider.